My first taste of bell pepper chutney was at a dinner party hosted by a friend. Typical Tamil brahmin cuisine never looked better than at her table. There the bright red bell pepper chutney sat alongside coconut rice. Complementary flavors , beautiful colors, friends and wonderful conversation… memories worth cherishing, food worth drooling over. I loved the chutney, and at that time I had a good size backyard garden where I was trying to grow vegetable (ahem!!). My bell pepper harvest was not worth mentioning, but a few did make their way into the chutney. If you grow peppers try to harvest them at different stages as it ripens and the colors change. Red bell pepper is naturally sweet while still retaining the crunch. I love to make jams and jellies with it. Don’t think so ? Well, try my Red Pepper Jelly and let me know :-). Bell peppers loaded with vitamins – specifically vitamins A, B & C, not to mention other nutrients. Peppers of all colors have high concentration vitamin C which is a very good immune booster. Add a handful of chopped peppers into salads or stir fries at the start of cold and flu season for an added immune boost. The raw and stir fried peppers are sweet while fire roasted ones have a hint of smoky flavor. This is a perfect complement to the sweetness. Roast it on the grill, in the oven or just on stove top. Cooking on open fire has a distinct appeal to senses – I guess part of it has go to do with the discovery and taming of fire. In our modern everyday cooking, with instapots and microwave ovens fire has all but disappeared. The peppers are very lean and could use a little bit of thickener. 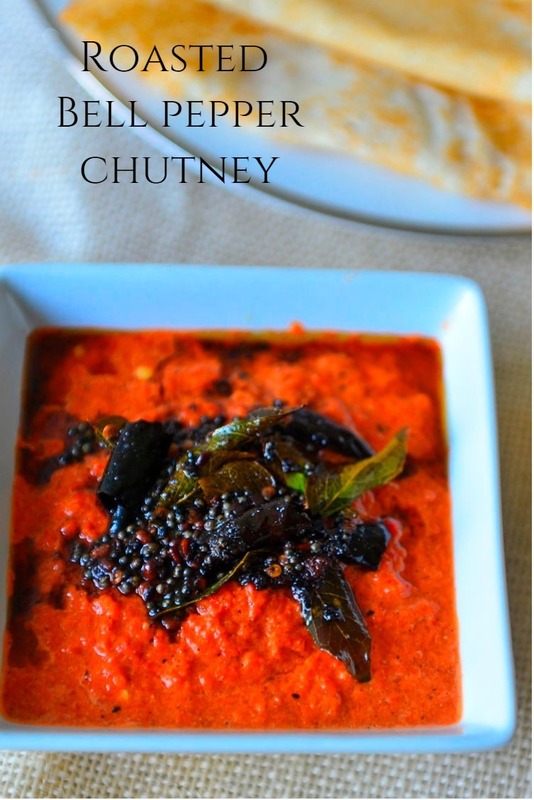 South Indian chutneys use a variety of vegan thickeners – dals (lentils), peanuts , sesame seeds or coconut. As an added benefit the dals increase the protein content of the dish. This is important if you are following a strict vegan , or vegetarian diet. As for me, I am neither so it is just a touch of lentils or sometimes none at all . My go to method to roast pepper is on stove top, over the open flame. Wash and dry the pepper, make sure that there are no cracks. This is important as the peppers have high water content and you would rather not have the juice run all over the stove as the pepper roasts. Place the pepper over the flame turning often until all the skin is charred all around. Take the roasted pepper and place it in a bowl and cover with a lid. Let it sit covered for 10 minutes. By the end of this time the pepper would have cooked through and the skin will be cool enough to touch and ready to peel off. Rub the skin off with your fingers or use a paper towel if necessary. 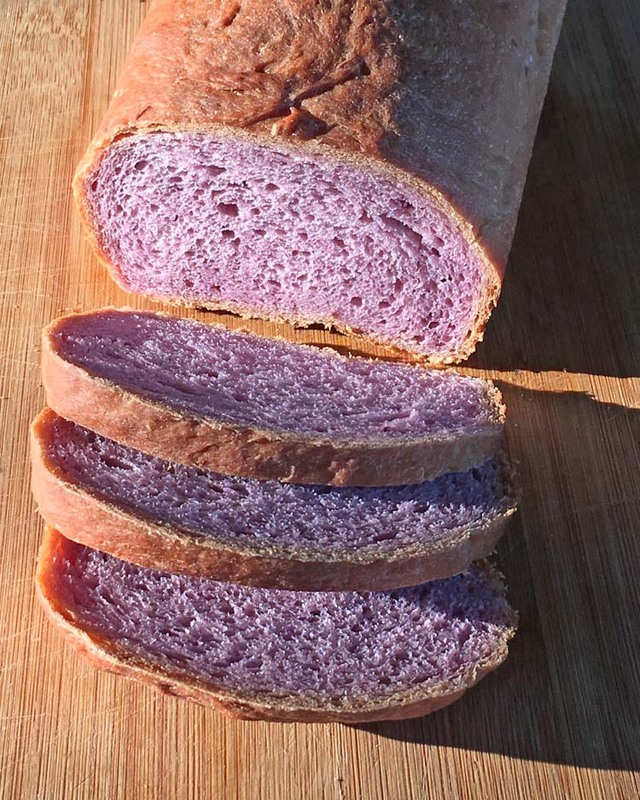 I do not rise the skin off , as I like to keep as much of nutrients intact and I like the bit of smokey flavors . Here you could go crazy and add 10 , 20 ingredients. Me, I am lazy , I like to keep it simple. When in a hurry I add a dollop of peanut butter, but urad dal and chana dal (split peas) are the traditional options. If you are allergic to peanuts add any nut butter you like or omit it all together. If using dals or peanuts dry roast in a pan and add to the blender and powder. Coming back to the peppers, chop the skinned bell peppers, remove the seeds and add to the blender bowl. The pepper juices trapped inside will ooze out as you cut into it. Do not discard this (again think nutrition !). The way I do it is to make a small hole on the pepper and drain the juices into the blender (for small quantities) or a bowl. Add the spices – bit of tamarind and salt – and grind to a fairly smooth paste. Empty the jar into a serving bowl. All that remains to be done now is to add the seasoning spices. This is where the magic of tadka . Fry the seasoning spices – curry leaves, dry red chilies, mustard seeds, hing, red chili powder – in hot oil and pour it all over the chutney. Just stir right before serving. 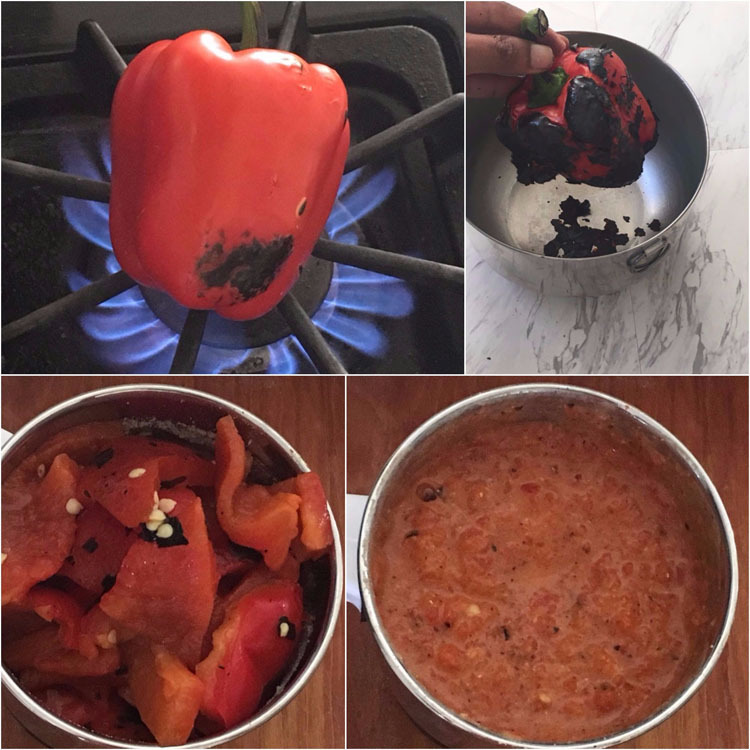 Here is the recipe for south Indian style roasted bell pepper chutney. 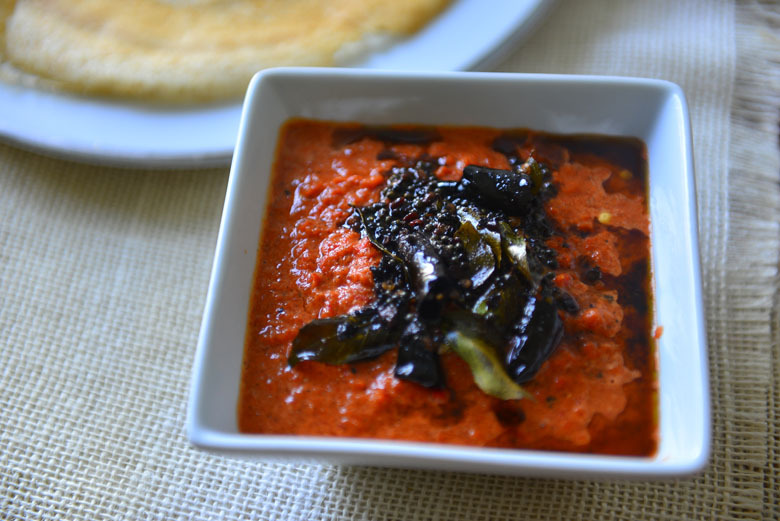 A spicy south Indian style chutney made with red bell peppers. Wash and dry the red bell peppers and roast them over open fire turning often. When all the skin is charred transfer the peppers into a bowl and cover with a lid. Set aside for 10 to 15 minutes. 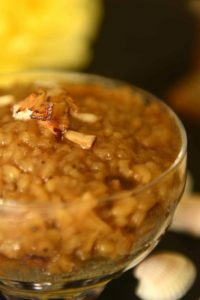 Dry roast the peanuts and urad dal in a pan. Transfer to the blender bowl along with a small piece of tamarind - about 1 cm cube - and pulse a few times until powdered. Peel the charred skin off the red peppers. Cut open, remove and discard the seeds and stems. 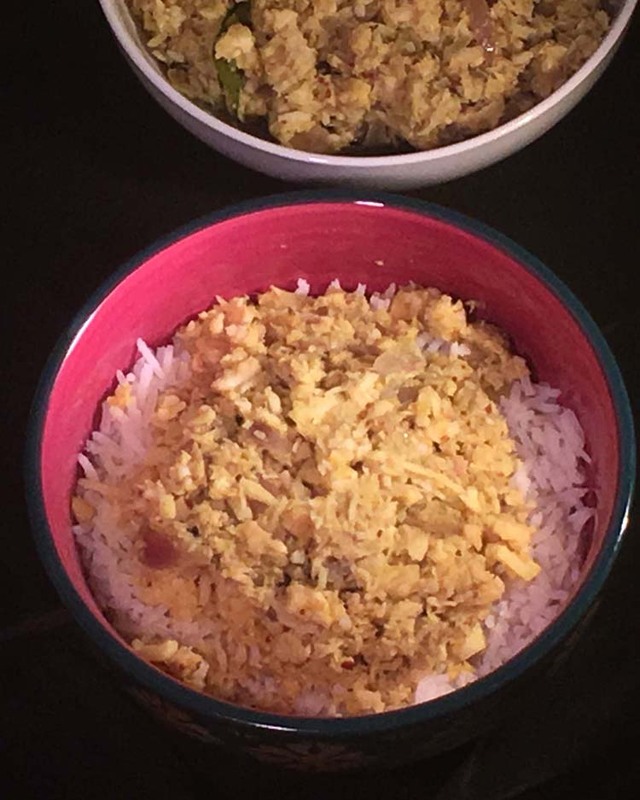 Chop the flesh into small pieces and add to the blender bowl. Add a little salt and grind coarsely. Taste and add more salt if needed and grind to a fairly smooth mix. Transfer to the serving dish. Heat oil in the pan. Add the mustard sees along with the red chili broken into pieces. When the mustard seeds splutter add the curry leaves and red chilies until the red chilies begin to smoke. Add the asafoetida and red chili powder and turn off the heat. Pour the smoking oil with the seasoning over the pepper chutney. You could omit the nut butters altogether, it gives a slightly less creamy version of the chutney. If asafoetida is not available skip it. It is commonly added in Indian dishes for digestive properties and is definitely an acquired taste. I am known to go crazy over the tadka. There is a certain member of the family who does not like to have “things” in chutney, jams sauces, etc. while some of us prefers the crunch. Waiting to mix the tadka just before serving works for both. 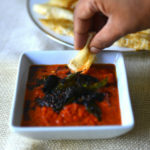 Like to try more south Indian Chutneys – here are a few ..